This Method Mix has been developed after extensive field-testing with breakdown times and base consistency of paramount importance. 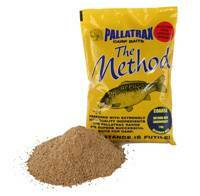 The Method Mix contains a blend of high protein food sources, seeds, flavourings and enhancers. Pallatrax's highly researched and comprehensive range of complex fishing groundbaits and fishing method mixes has been developed using only the finest quality ingredients, with breakdown times and base consistency of paramount importance. This product contains actual Dried Bloodworm and Dried Maggot from our Dried Naturals Range, added to our own Red Seed Mix along with ground pellet, whey proteins, Robin Red and enhancers. Carp Crush is based on our Yellow Seed Mix along with ground pellet, whey proteins, Robin Red and enhancers.